I recently bought a new car. Actually, I’ve bought quite a few cars in my lifetime, which is simply because I am now very old. What intrigues me about this latest purchase is how different it was from my past behaviour. In the past it was a simple process. Something triggered a need for me requiring a new car – which may or may not have been justified, but that doesn’t matter: in my mind I needed one. And then I became occupied in quite a pleasant process of considering which car I would choose by a mixture of processes of which I was only vaguely conscious. Of course, I had the experience of the car which I currently owned and this was a major sway. However, I didn’t necessarily want to be boring and replace like with like and so I could not help but see all the choices available to me on the roads I travelled. I took more interest in the cars I fancied and judged them on style and possibly (who knows?) on the type of people who drove them. And then there was the influence of my friends. Talking about cars is a man’s favourite subject (well, at least one of them) and I was not short of other people’s opinions. This was layered by a good smattering of intelligence gathered from reading car magazines, which I devoured with relish. Next would be the visit to the showroom. Here I could breathe the smell of new leather and polish, and listen to the dulcet tones of the sales person who would seek to shorten my decision making process and have me drive away in one of their limos. All this has now changed. Thanks to the internet, this time when a gremlin told me that I needed a new car, the first thing I did was go online. I didn’t do this just once or twice but spent many a happy hour browsing different cars, looking at the tax position of owning them, considering their CO2 output, their retail price, their second-hand price and goodness knows what. I was an expert on every car in my consideration set without talking to a soul and without reading any magazines (except those that were online). This has caused me to reflect on a major change that has taken place in the decision making process. In this new process, at an early stage, something takes place which is what Google calls the Zero Moment Of Truth – ZMOT. It is the first moment of truth, hence Zero Moment. It is what we do before anything else. We do it because it is so easy. A click of the mouse takes us to comparison websites, company websites, blogs and reviews. It provides us with the quickest and possibly the most objective intelligence on prospective products that anyone could provide. From many of the research surveys we have carried out in business-to-business markets we believe that many people who are buying a new product are likely to give serious consideration to the brand that they currently use. This is a sensible and easy decision. If something has served you well in the past and you need a new one, why not look to replace like with like. The proportion of people who would consider a like for like replacement has stayed the same over the years at somewhere between 60% and 80%. 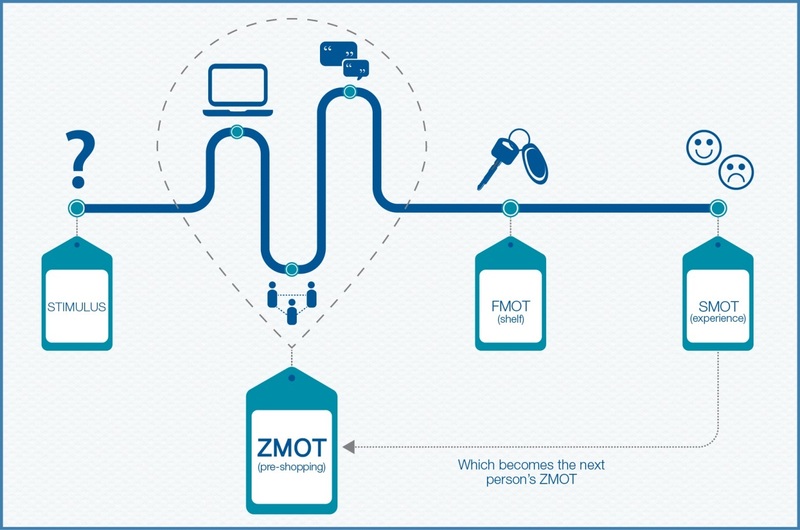 What has changed has been the influence on the decision itself by ZMOT. In the past the likelihood of a repeat purchase was higher than it is today. Today, armed with the Zero Moment Of Truth, business-to-business decision makers (just like the general public) garner intelligence which may very well prompt them to switch their allegiance. According to Google, a half of all buyers of technology products carry out an online search before making their buying decision. A similar proportion will have talked about the product with colleagues and that too will have had a major influence. These two factors are more important than any others and point to the importance of making sure that our products are right at the top of any Google search. Indeed, it is hoped that by the time the Google search string has been half written, the brand will have already appeared in the prompt box. Search engine optimisation (SEO) is the name of the game in making sure that our products have influence at the Zero Moment Of Truth. Another major influence on the Zero Moment Of Truth are the reviews that people can read online. How many companies have someone within their organisation who is responsible for managing these reviews? I don’t mean someone who is manipulating them but someone who is at least responding to them and understanding how they affect decision making. Reviews might seem scary to a marketer, perhaps fearing that they could say something bad about the product or company. In reality, most reviews are good which isn’t unreasonable as one would hope that most products perform as expected and therefore elicit a positive response. Where there is a negative response it can sometimes add to the authenticity of the reviews in that readers will now be of the view that they are more believable. Finally, how long does all this take? 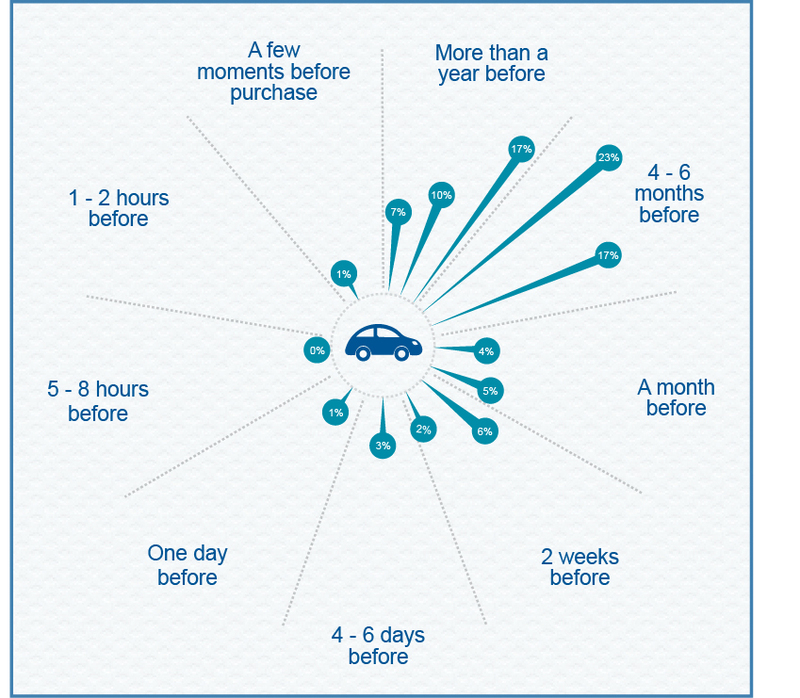 From the time I first explored my choice of car through to the time I made the purchase was around three months. Interestingly, I made my decision (an Audi A5 as it happens) without going to any showroom and indeed without speaking to a dealer. I chose the car of my liking and asked a colleague who loves this sort of thing to do the transaction for me. The car was delivered to my door without any interaction by me with Audi. During this process my online activity looked something like a declining heartbeat and is indicated in the figure below. Make search engine optimisation a priority. When someone searches for your product, be obsessive about making sure you are in the top five results for almost every configuration of search string someone could put together. Make sure that you anticipate people’s interest in your products and talk about them online. It seems an obvious point to make but you should only talk about things that are of interest to your customers, not your self-obsessions. For example, McKinsey recently reviewed a bunch of global B2B companies’ websites and found that over 80% talked about corporate social responsibility, sustainability practices, and global reach – none of which was of any interest at all to buyers. Encourage people to write reviews and testimonials on your company and its products. These will have far more impact than anything that you say. Make Zero Moment Of Truth the responsibility of someone within your company – preferably someone with seniority who will champion the cause and ensure that your name is on the customer’s buying list from day one.